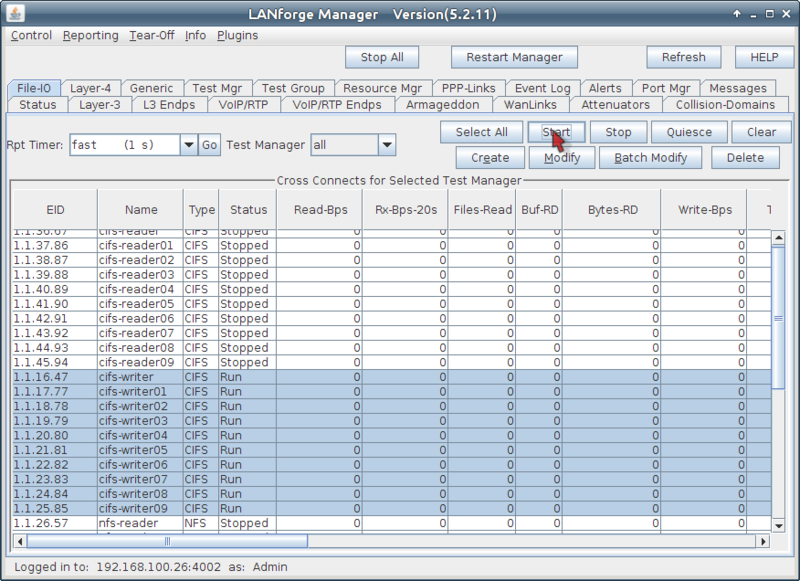 Goal: Create a series of MAC-VLAN based clients to emulate CIFS and NFS traffic. 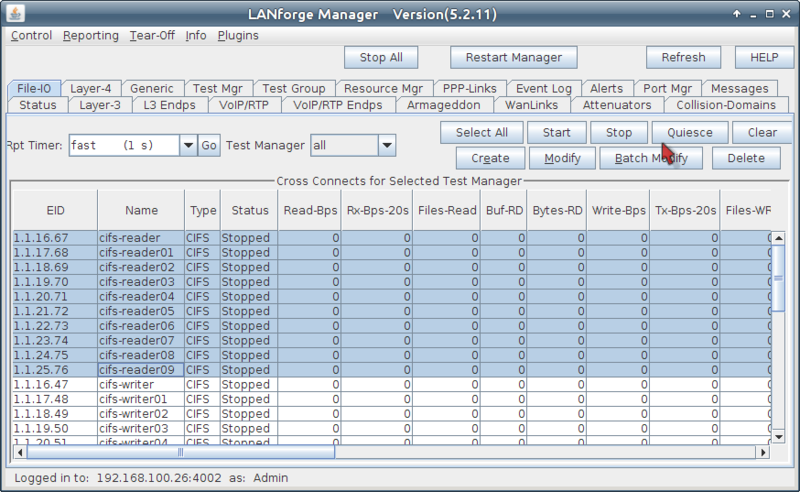 This cookbook connects a LANforge system to a file server with CIFS and NFS shares available. 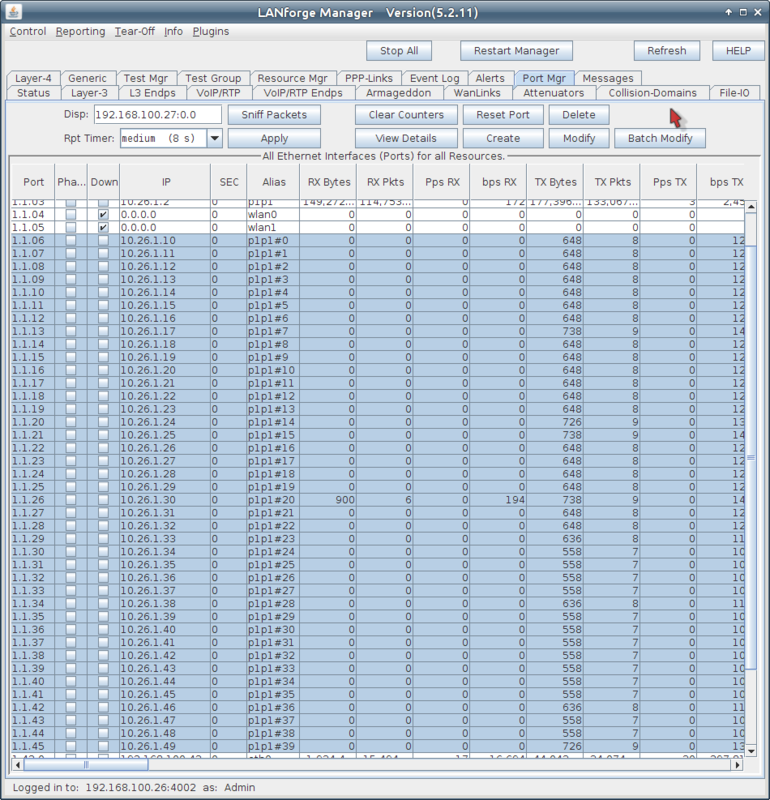 The file server in this example will be 10.26.1.3. It will be sharing smb://10.26.1.3/fileio and 10.26.1.3:/home/fileio. We will create ten readers and ten writers for each file sharing protocol. 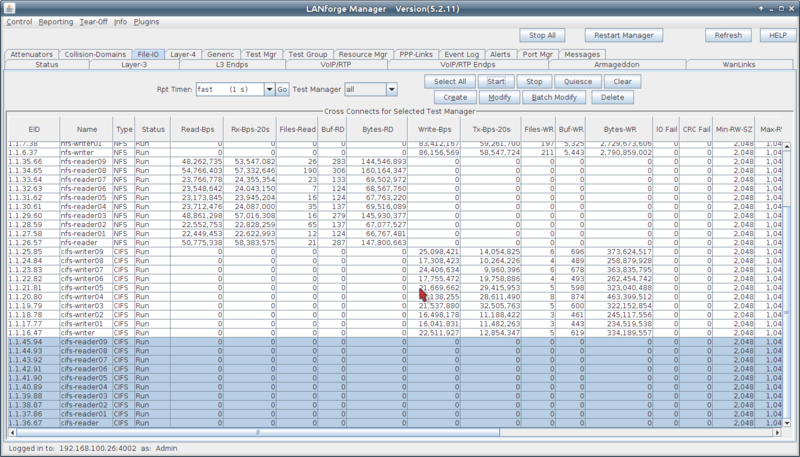 This demonstrates using the Batch Create tool in the FileIO tab. 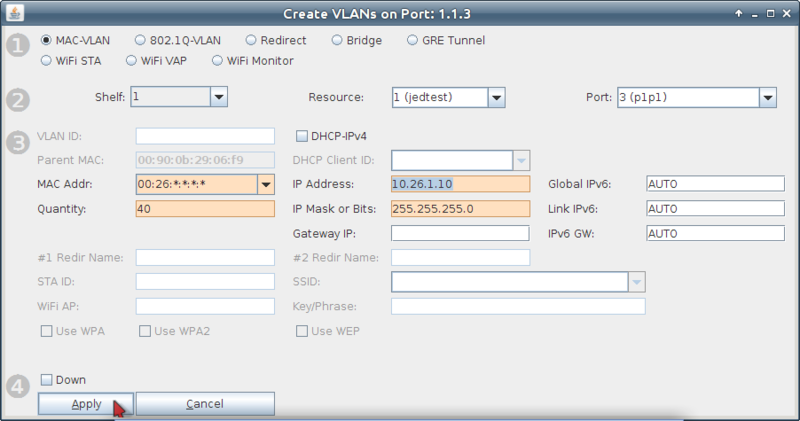 Create initial MAC VLANS for our emulated endpoints. 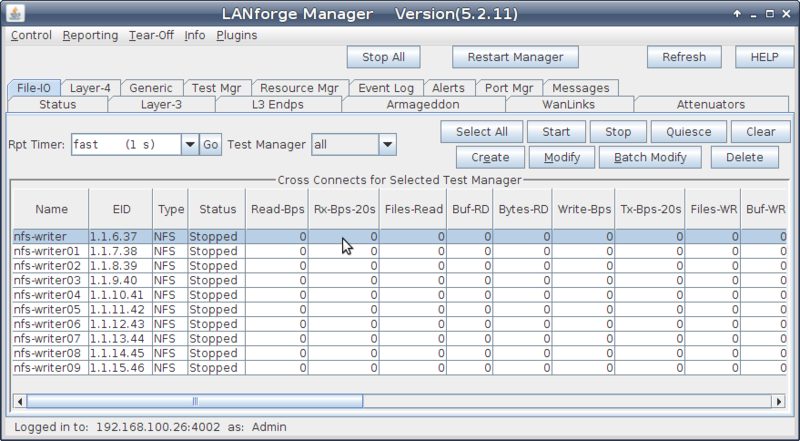 In the Port Mgr tab, highlight a a non-management port on your LANforge FIRE system and click Create. Create 40 MAC VLANS with IPs starting at 10.26.1.10. Enter 10.26.1.10 and 255.255.255.0for the IP and netmask. Click Apply to create the MAC VLANs. Click Cancel to close the Create window. See the 40 MAC VLANs in the Ports tab. 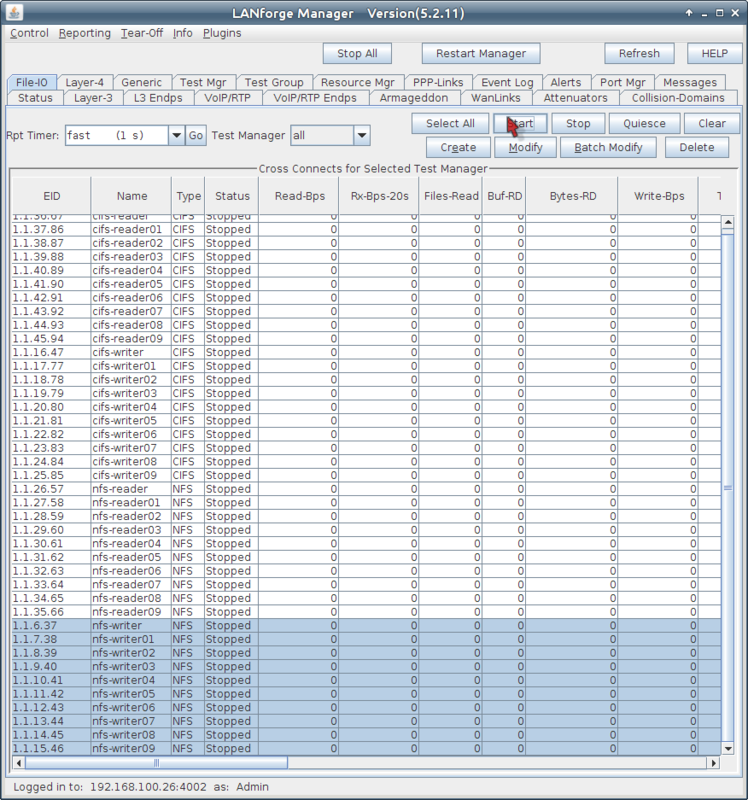 Create your first FileIO NFS Endpoint. In the FileIO tab, click Create. 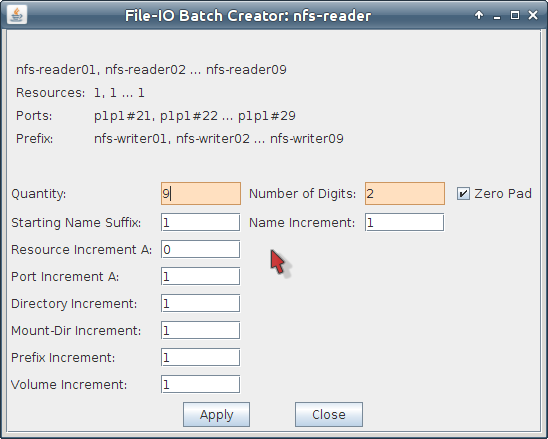 Use the following settings to create a NFS reader writer endpoint. Enter nfs-writer for the name. 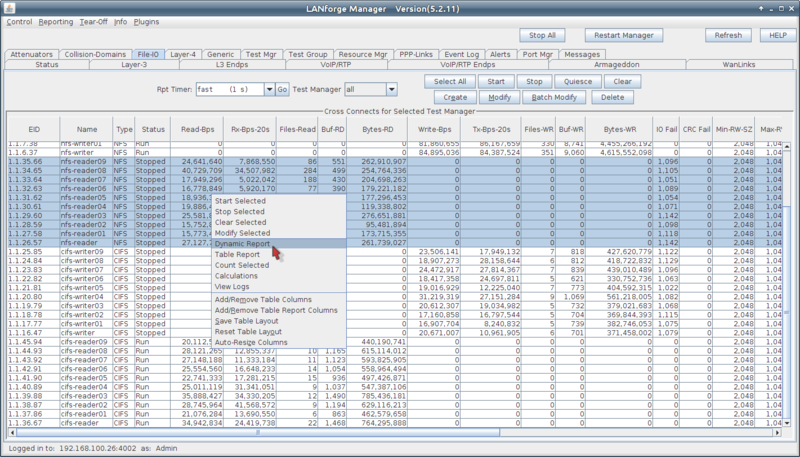 The File-IO Details dialog appears. Click the Batch Create button at the bottom of the screen. 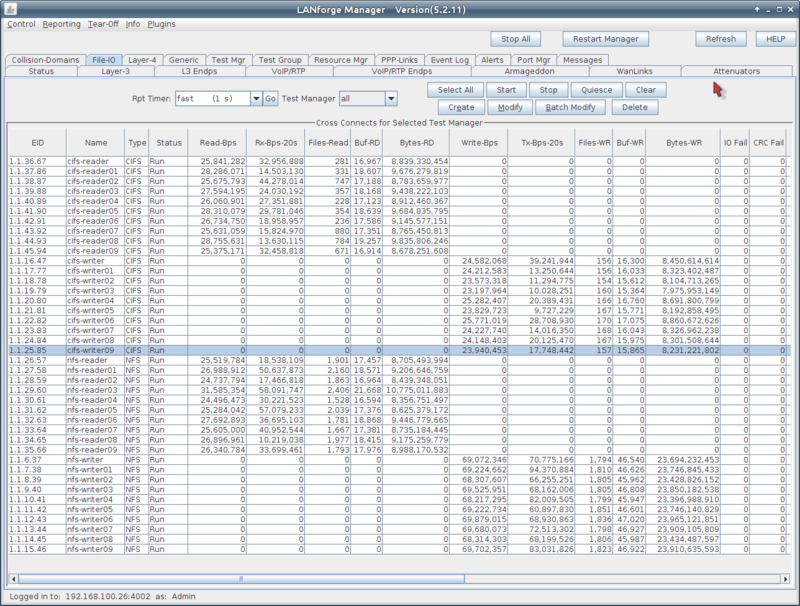 Close the Batch Create window. 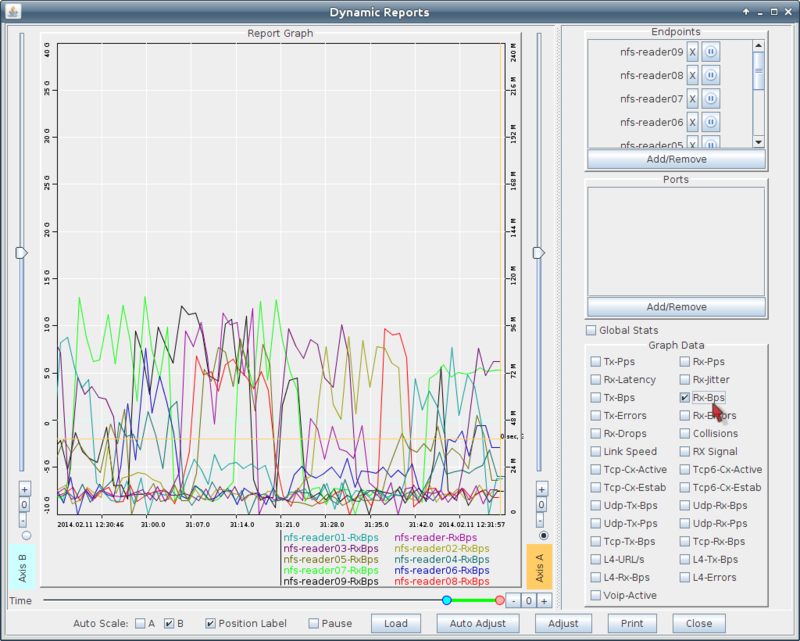 You will see the new endpoints. 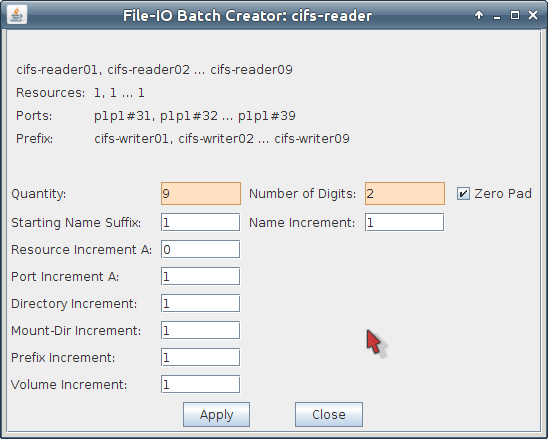 Create initial endpoint for CIFS writer. 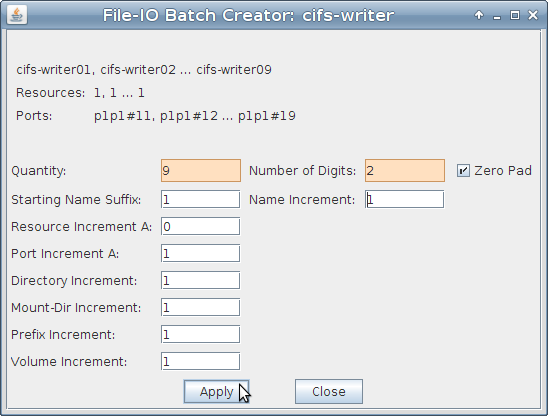 Use Batch Create to create nine more CIFS endpoints. You do not actually need to close the Create/Modify window. 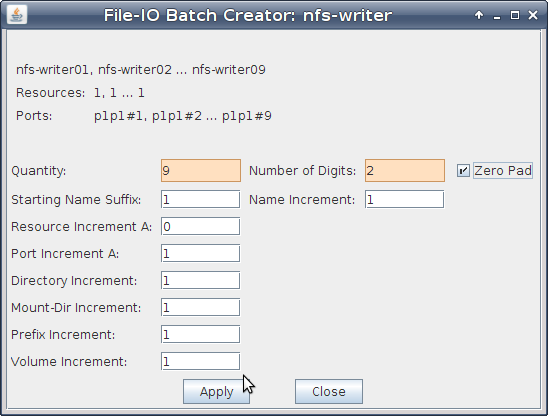 Click on Batch Create directly. 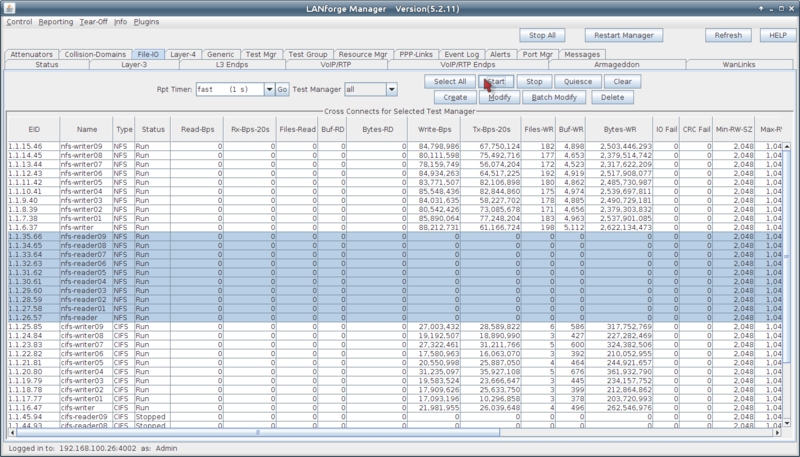 In the File-IO tab, you will see ten more endpoints. In the File-IO tab, we see our newly created reader endpoints. Click the Start button at the top.